Green Party nominee Jill Stein spent nearly $1 million of the funds she raised for recount efforts in three battleground states on consultants, staff, and administrative costs. Stein, who pushed for recounts in Wisconsin, Pennsylvania, and Michigan, raised $7.3 million for the efforts and said that "every dollar" went towards costs associated with the recount efforts. The group, which claimed costs associated with the recounts hit $7.4 million, upped their fundraising goal four times since first calling for recounts. According to a breakdown of expenses contained on the fund’s website, Stein paid nearly $1 million on consultants and staff. The staff payroll tallied $212,500 while consultants pocketed $364,000. Administrative expenses, such as travel costs, ran $353,618. In all, $930,118 was used to pay consultants, staff, and administrative costs. Filing fees in the three states cost $4,488,939, the group says. Wisconsin filing fees totaled $3,499,689, Pennsylvania fees were $16,000, and Michigan filing fees ran the group $973,250. Legal expenses cost the group $1.6 million. Stein’s recount efforts hit roadblocks in both Michigan and Pennsylvania after being blocked by courts in both states. 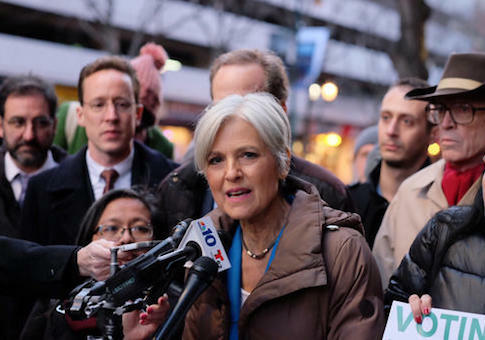 A federal judge on Monday rejected Stein’s recount request in Pennsylvania. Another federal judge put an end to Stein’s recount efforts in Michigan last week. Wisconsin, the only state where a recount was launched, wrapped up its effort on Monday. After counting more than 3 million ballots, Trump was shown to have won the state by 131 more net votes than he had before the recount had taken place. Trump defeated Hillary Clinton in Wisconsin by more than 22,000 votes. The recount efforts pulled in more than twice as much as Stein’s campaign had throughout the entire 2016 election cycle. Stein’s campaign committee received $3.2 million in contributions and finished with $87,740 in debts, according to campaign finance records filed with the Federal Election Commission. The unsuccessful efforts garnered massive amounts of media attention for Stein who received very little publicity during the election. Stein received 12 times more coverage from the recounts than she had from her campaign, according to a study conducted by the Media Research Center. "When Jill Stein was the Green Party’s candidate for U.S. president, the networks only gave her 36 seconds of coverage," the watchdog wrote. "However, as soon as she launched a campaign to contest the presidential election and demand a recount of ballots in several key states, the evening news shows on ABC, CBS and NBC managed to find 7 minutes and 26 seconds of coverage for her in just four days. " President-elect Donald Trump previously called the recount efforts a "scam." Rep. Paul Ryan has referred to them as a "ridiculous fundraising and publicity stunt." Stein’s team did not immediately return a request for comment on the amount of recount funds that were spent on staff and consultants. This entry was posted in Politics and tagged 2016 Election, Jill Stein. Bookmark the permalink.